On the 29th May 2015 Captain John Theopholus Chapman was remembered in a short service at Loughborough Carillon. Mrs Pauline Day, laid flowers in memory of Captain Chapman, as did Captain Chapman's great-great nephew, James Evans. Died of Wounds 30th May 1915, Aged 26. John Chapman, born in Loughborough in1889, was the son of John Ernest Theophilus Chapman, a boot maker and dealer and Elizabeth Anne Chapman (nee Cumberland). He had 4 sisters: Gladys (b. 1890) Helen (b.1889) Dorothy (b. 1882) and Edith (b. 1879) and a brother, Hubert (b. 1886), all born in Loughborough. In April 1891 the family lived at 34 Park Lane, Loughborough. In 1897 Harold was born and in 1911 the family lived at Westfields, Ashby Road, Loughborough and John was an electrical engineering student. 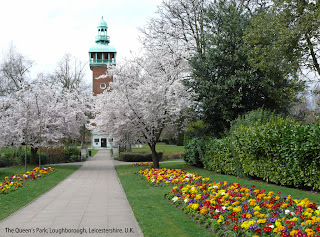 When the 5th Leicester Territorials were mobilised in August 1914 only one of the officers of the Loughborough Company was living in the town. They all, however, responded to the call - Lieutenant John Chapman leaving his appointment in London to join the ranks. Before many weeks he was promoted Captain, and his company, and the men who under his command were billeted in Luton, found him a considerate and a careful officer. The Melton Mowbray Times & Vale of Belvoir Gazette published an article on Friday, 4th June 1915 entitled: District War Items - Loughborough Officer’s Death from Wounds. * Captain Chapman died in Wandsworth, Surrey. Capt. Chapman was reconnoitring the enemy's position by the aid of field glasses, when he was shot between the eyes. The injury was severe and from the first it was feared that fatal results would follow. He was conveyed to England and every care taken, but the injury was fatal and he passed away on Sunday, 30th May 1915. His coffin was conveyed from London to Loughborough and six men of the 3rd 5th Leicesters, being at the station, carried the coffin, draped with the Union Jack, shoulder high from the train to the hearse, which slowly made its way from the railway station to the Parish Church, attended by many people. At the church the body rested during the night and the following morning, being guarded by relays of four soldiers from the 3rd/5th Battalion, Leicestershire Regiment, relieved every two hours. The funeral was timed for three o'clock at the church and never in the history of the town probably had there been such a funeral in Loughborough. John’s brother Hubert also died in WW1, in 1917.